Is there such a place as hell that is described in the Bible? 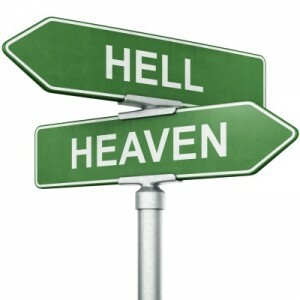 Why do more people believe in heaven than they do in hell? How can heaven exist and not hell? What does the Bible say about hell being a real place? Jesus actually spoke more about hell than He ever did about heaven. Jesus actually spoke more about hell than He ever did about heaven. Jesus spoke about hell as a literal place of torment that is never ending. What are the three different types of hell that are mentioned in the Bible? Some believe that there are different levels of hell where suffering is worse than other levels. To a degree, the torment someone will suffer in hell is determined by the works of the unsaved person. One of the hells mentioned in the Old Testament and New is the grave itself. The word “hell” is actually an old English word that originally meant just a hole in the ground and can be thought of as a grave. The English used to keep their potatoes in “hell” or in the ground cellar that they used for storing them. The term hell can also mean a place of the deceased or dead and merely described the abode of the dead. Since Jesus spoke more about hell than heaven, we know that this place must be real and that there are also different degrees of punishment and torment in hell (Luke 12:47-48). Hades is referred to as the place where the dead go and is not necessarily a place of torment for the wicked. This Greek term was used in the New Testament to mean the grave. It can also refer to death as it does in 1 Corinthians 15:55, in the King James Version, “O death, where is thy sting? O grave, where is thy victory?” Jesus used it in this context in Matthew 16:18 saying, “upon this rock I will build my church; and the gates of hell (Hades) shall not prevail against it.” Hades also appears to be a place of refuse and is not normally associated with a place of torment. The one exception is where it is used in reference to Lazarus and the rich man (Luke 16:23). Another term for hell that is used is Gehenna. This refers to a place that was called Valley of the Sons of Hinnom. In the New Testament it is referred to as being a place of fire (Matt 23:15, 33; Mk 9:43, 45, 47; Lk 12:5, Matt 5: 29, 30; Matt 10:28; Matt 18:9). This valley was a place where refuse and sometimes dead bodies were thrown and the fire never went out because it was continually being added to. It is much like a city dump that is constantly being burned to keep it from piling up to unmanageable size. The word Sheol is a Hebrew word that means much the same as the word Hades does. It is a grave or place where the dead abide. It is described as the common grave of all of mankind who have died. Job describes it as a place where the righteous and unrighteous go (Job 3:11-19). The old Italian proverb describes Sheol perfectly: “After the game, the pawn and the king go into the same box.” This means that the rich and mighty go the same way and to the same place as the poor and powerless – the grave. One thing we see is that once a person dies without Christ, they are separated from any possibility of being saved from the fires of hell. You might notice that Abraham said that no one can cross over from their place in agony or expect to receive any relief. Once a person has been judged, they cannot cross over or go back to warn their friends or their family. Neither will any relief come from their torment or even a quenching of their severe thirst. It is described as a place of torment that is the result of fiery flames. It is no wonder then that Jesus spoke more about it and warned more people more often about hell than any other subject in the New Testament. So you can see that all five senses will be involved: Smell, sight, touch, hearing, and tasting. In addition and perhaps worse of all memories happen in hell too. The rich man still knew about his unsaved family members. The rich man knew about Lazarus who was then being eternally comforted and had eternal rewards and everlasting life. Some teach that those who are lost will have a second chance and that they will be offered another opportunity for eternal life after Christ returns again, but I cannot find Scriptural support for this belief. Jesus never mentioned anything about another opportunity after judgment. That is why He spoke so often of hell and gave some of the most serious warnings in the Bible, like in Matthew 7: 21-23, “Not everyone who says to me, ‘Lord, Lord,’ will enter the kingdom of heaven, but only the one who does the will of my Father who is in heaven. Many will say to me on that day, ‘Lord, Lord, did we not prophesy in your name and in your name drive out demons and in your name perform many miracles?’ Then I will tell them plainly, ‘I never knew you. Away from me, you evildoers!’” There can be nothing more terrifying than to discover on the day of Christ’s return that you thought you were on your way to heaven but Jesus doesn’t recognize you and tells you to go the way of all evildoers. Revelation 20:15 says this: “Anyone whose name was not found written in the book of life was thrown into the lake of fire.” The only way your name gets written in the book of life is when you believe in what Jesus did on the cross for you. If you do not believe then it is still not too late. I pray that today will be your day of salvation (Heb 4:7). Jesus could return at any moment. Will you be headed to heaven or to hell? The choice is yours. Heaven is for real but so is hell. Please choose life – eternal life in Jesus Christ (John 3:16-17). And do it today while it is still called today (2 Cor 6:2). Can I inquire into the belief of the Illuminati, freemasons, etc… Just wondering if any one can comment on these in the manner of hoax, or is true and has a hand in the coming of the Anti christ. Thank you once again. God bless you. Wow Melisa. How very interesting that you asked this question because I just completed an article called “What Is the Illuminati Conspiracy Theory? Is It In the Bible?” It should be published in April, not that long from now. It is a hoax by the way. There is not reputable evidence about this. They do not, from what I can tell, have any hand in the anti-Christ. For more on the anti-Christ, please read this of ours we have already published. As for the Illuminati Conspiracy Theory, it is just that…a theory with no actual proof. This article is coming soon but I will say that I can not find anything remotely close to the Illuminati Conspiracy Theory in the Holy Scriptures or in world events. In the first place,a theory by definition is conjectural, a supposition and is hypothetical. Fact and theories are not the same thing. Facts are concrete, empirical evidence with tangible proof. Theories are full of assumptions and lack complete proof; otherwise it would not be called a theory. Something that is theoretical is a hope-so; something that is factual is a know-so. This conspiracy theory has been floating around a very long time. To believe a select, secret society of Jesuit priests or supporters of the Jewish nation controls the world’s economy is nothing short of ludicrous and lacks any distinguishable evidence. Besides, God is still and always will be in control. Nothing happens on this earth without first passing thru the nail pierced hands of Christ. Hope that helps Melisa. Thank you and God bless. Does God ever predestination anyone to hell? Jimmy, God never sends anyone to hell, predestined or not. People send themselves there by rejecting Jesus Christ. God gives us all free. I don’t exactly know how free will and predestination work together but that’s what makes God, God! He is beyond complete human comprehension. For anyone wishing to delve further into the thorny issue of hell I recommend David Powys’ book: ‘Hell’: A Hard Look at a Hard Question (subtitled: The Fate of the Unrighteous in New Testament Thought). I hasten to state that I am a layman wanting to better understand God’s Word, and lack the necessary skills to understand much of his work (especially original Greek and Hebrew). I find it very hard to discount what is generally considered the ‘traditional’ concept of a real physical hell, but am also challenged by many of Dr Powys’ ‘points’. The book is a rework of his doctoral thesis and whilst it isn’t a light read his detailed study of historical thoughts and understandings sheds a lot of light (and therefore shadows!) on the subject. Probably the one thing which stands out for me is Dr Powys’ preparedness to tackle all opinions on various topics and, on occasions, conceding his lack of satisfactory counter arguments. To date I have not able to find any works which address the same range of points covered, which is disappointing. Most books supporting the ‘traditional’ viewpoints seem to rest their cases on, say, a dozen popular Bible passages and ignore many others. I WANT to find good scholarly discussion rebutting or answering many of Dr Powys’ points, but it seems to be lacking. It is important that I clearly state that I count Dr Powys as a friend. I raise his book as a thought provoking work, neither endorsing nor condemning it, which has challenged me to question and justify my beliefs. In doing so his thesis has encouraged me to be more considerate of others’ well thought out ideas, whether or not I am convinced by them. How should we as Christians reconcile seemingly contradictory teachings of the state of the dead in the Bible like those in Job 3:11-19 and other old testament verses stating that all, both bad and good go to the same place after death, with the new testament story Jesus told of Lazarus and the rich man which shows the poor Lazarus going to paradise and the rich man going to torment? Hello Candi. Thank you for your comment and question. Job 3:11-19 does not say that the good and the bad go to the same place, Job said that “The small and the great are there, and the slaves are freed from their owners.” The small (like slaves) and the great (like masters) does not refer to the saved and the unsaved so I guess I am not understanding your question. Are you saying that the “bad” or unsaved do not go to a place of torment? Just wondering. Further to Mr Wellman’s comment, after reading your comment about Lazarus and the rich man I think that you are perhaps misunderstanding the what Jesus was saying. He was not condemning the rich man per se, but his attitude and lack of faith. The rich man won’t be saved by his wealth and status, or even for what he does with his money. Even if he gives it to charity the rich man must first accept our Lord Jesus as his saviour. Good works that flow from being a true disciple of Jesus is what Jesus wants. He wants to see evidence of change of heart and attitude as a result of being a true follower. Firstly and foremost we must accept Jesus as Sovereign Lord, and because of that we should have a different attitude which will include good works. Heaven is available for ALL people, regardless of their earthly status. Despite the teaching of the Roman Church we cannot buy forgiveness or our way to heaven. It is freely granted by grace to EVERYONE who truly turns to Jesus. To your knowledge, does a theory exist (before now) that the soul of each man was once either angel or demon prior to human birth. Men with demon souls where at one point in their past repentant and given an undetermined amount of chances to believe and to be redeemed themselves, thus the human existence. And men with angel souls are fallen angels whom the Lord has given a temporary human existence? Thank you Patricia. I believe that there are theories for about anything but I have not heard this theory. The bottom line is that there is no biblical evidence for this to be true and it is not found in the Bible so I don’t believe that it is so, otherwise God would have revealed this in the Bible since it would seed to be important enough to be included. I trust the Bible. Theories, not so much. Thanks for answering me Jack and Peter. I guess my question is that in Job 3:17 when he is talking about death, he says that the wicked cease from turmoil. Also there are verses in psalms (115:17 ) that state that the dead don’t praise the Lord. I thought that if you die and go to Heaven, you’d definitely be praising Jesus. Also in Ecclesiastes 9:5-6 it says that the dead don’t know anything. Also in 1 Sam 28: 3-20 it tells the story of King Saul resurrecting Samuel from the dead and Samuel says that Saul will be with him the next day, implying that Saul will be in Heaven, even though he deliberately went against everything God commanded and was demon possessed? Samuel was in the grave. That is Samuel was dead and so would Saul and his kingship would be ended. These Old Testament Scriptures were before Christ died and made a way into the Kingdom of Heaven. The dead are awaiting this Kingdom. Yes, Job said the wicked cease from turmoil but he is talking about their physical life and not the after life to come. Yes, the dead, as the Psalmist says, don’t praise God because only the living can do this while on earth. Read all of 2 Cor 5 to see that today, when we are in the Lord, we will be with the Lord after death. in history of China 2580 B.C. a emperor name Yellow emperor or Huang Di he went up to mountain of Tai looking at sky confess and said I only serve one Lord not a two lord He is Shang Di (the Creator). Taken from the book written by Sima Qian. If the Yellow emperor died is he have a chance going to heaven because dont have any prophet to convince him from that era got only a prophet Moses. dear pastor Jack in new testament got two Lazarus is two of them a same person that our King mention. According to my understand our King said Lazarus in paradise with Abraham after that our King raise him from the dead is that true. The name Lazarus is a very common name so these two may have been different but today we know that Lazarus is long since dead and is in Paradise (heaven). Thanks pastor for the answer…I from south east asia got 3 kind of races chinese, malay and indian the majority religion in my country is islam is illegal for sharing a gospel to malay people. But very upset the chinese buddhism rejected my gospel that I sharing to them. But I saw some missionaries from Gideon Bible Society or another church sharing the gospel so very easy a lot of people accepted christ, I dont know why! Maybe im new born christian is that no luck for me. I am glad that the Gideon’s are helping to spread the gospel. It is not luck that you are saved and many Muslims are not. It depends upon God the Holy Spirit. God draws people to Christ (John 6:44) and so we don ‘t really need to worry if many are being lost because God determines that but God DOES use us to tell others about Christ. We just have to let God be God and trust in Him. People are saved and it is not OUR responsibility to save them. It is THEIR response to HIS ability although it is our responsibility to share the gospel. When we share the Gospel to the unsaved, and we tell them about the saving Grace of Jesus, are we also to tell them about hell? I am very confused about this as to my thinking time is very short and Jesus may return at any moment. If a house was on fire and people were inside I would bang on the door and tell them that if they don’t come out they will burn up in the fire. Thank you Theresa. Jesus spoke 3 times as much about hell as He ever did heaven. Why? Because He wanted to warn them of the wrath to come (John 3:36b; John 3:18, etc.). If we don’t tell people that if they step out of this life without Christ, they will be forever separated from God, then they won’t see any need to repent. If there were people sleeping up stairs and there was a fire downstairs, would we not want to tell them that a fire is headed their way? God’s mercy is relevant only because of Gods’ wrath that is to come (Rev 20:11-15). The good news is only good unless people hear the bad news first. If I were a doctor and gave you some medicine, you would say “Hey, I’m not sick. I don’t need this.” But if the doctor tells them “Hey, I got your blood works test back and your x-rays and if you don’t take this medicine, you’re going to die.” Make sense? “For those who actually go there ” meaning people who didn’t trust in Christ and didn’t repent right? Do you have an article on how to find a good church? Jessica. I am so glad you are feeling better. Here is one article called ” How to Find a Bible Believing Church” at this link http://www.whatchristianswanttoknow.com/how-to-find-a-bible-believing-church/ and “7 Tips on how to Choose a Church” at: http://www.whatchristianswanttoknow.com/how-to-choose-a-church-7-things-to-look-for/ I wish you were in Kansas because I believe you’d love our little flock of the church that I am pastor of. Ah, thank you for your kind words 🙂 I’m feeling great! I believe that there is really a hell unfortunately many people are going there. But I also believe that there is a heaven with a merciful God there. So there is hope for the future fir all of us. Hell was well explained above. in Heaven, there is a gulf that seperates the saved from the unsaved. The rich man asking God to be able to go back and save his brother from going there is an example of hell. Hell is the separation from God. Think of this, How could there never be a tear shed in Heaven if we knew our loved ones were being tortured eternally??? The soul is judged and if not found worthy the soul is destroyed. We all have to start learning what the God teache. and to not just depend of what the church teaches. You are responsible for your soul, not the church. When you are before judgement with God your lawyer and pastor are NOT going to be there to defend you. Just you and God and God knows your heart. Do u have an article explaining more about believing in ancestors and God at the same time..I’m from that kind of a family which we clash as I dont believe in ancestors. I’m a born again. Previous post: What Are The Seven Deadly Sins and Their Meanings?